Modern Scandinavian design. Intuitive technology. Smart storage. The compact SUV, by Volvo Cars. Introducing the new Volvo XC40 – the small SUV that’s big on innovation. With expressive design, ingenious storage and smart technology, it’s built for city life. Friends and family can share your car. Without a physical key. Sharing is the way forward, to preserve resources and experience the rewards of more connected, sustainable lifestyles. The XC40 features an innovative system that lets you remotely share your car for a set period. Leave it at the airport and let your friend use it for the weekend, saving you the parking fee. Innovative car sharing opens up a world of possibilities – it means that a friend or colleague can access or borrow your car, wherever you are and wherever your car is. It’s connected thinking for a connected world. Declutter your life and experience a new interior. We talked to customers all over the world to understand what they want from a car. Smart storage for their everyday things came high on the list. That’s why you’ll find loads of smart storage features in the passenger and luggage compartments. Storage space in the door holds a laptop or three large water bottles. Under the centre armrest, an area for your things comes complete with a waste basket. And there’s even a hook on the glove compartment to hold your bag or that take-away dinner. A place for everything. Large, extremely flexible and easy to access. The luggage compartment features a folding floor that adapts to what you are carrying and is lockable. To pack larger items, fold the backrest with the touch of a button. Technology designed to make things easier. The XC40’s smart tech features all have one thing in common: they are there to make your life easier, to remove day-to-day hassles. They let you stay connected, help you park the car, charge your phone and so much more. The 360° Camera uses images from several cameras to create a view of the car as seen from above. You can clearly see where your car is in relation to other objects around the car. Just beneath the centre touch screen there is a space for your mobile phone. Placed here it is not only conveniently accessible, it is also charged wirelessly. With Apple CarPlay and Android Auto you get smartphone functionality in the centre touch screen. Your favourite apps become easily available and you can connect with Apple Siri or Google Assistant. Helping you stay safe on the road. The Volvo XC40 acts as your co-pilot, always looking out for you. A number of systems and functions help you stay on the road and avoid accidents. It even detects if someone is about to run into you. After all, the best crash protection is not to crash. City Safety constantly monitors what is ahead of your XC40. It identifies other vehicles, pedestrians, cyclists and large animals ahead, warning you if a collision is imminent. If you don’t react in time then it will brake automatically to help avoid or mitigate a collision. “It’s just like having eyes in the back of your head.” If there's crossing traffic when you reverse out of a parking space, Cross Traffic Alert warns with audible warnings from the left or right rear loudspeaker and by graphics in the centre display. Pilot Assist, a driver assistance feature, with Adaptive Cruise Control means you get gentle steering support to help keep the car centred in its lane and at a set speed or distance from the car in front. Control your car from wherever you are. Volvo On Call is a true digital multi-tool. 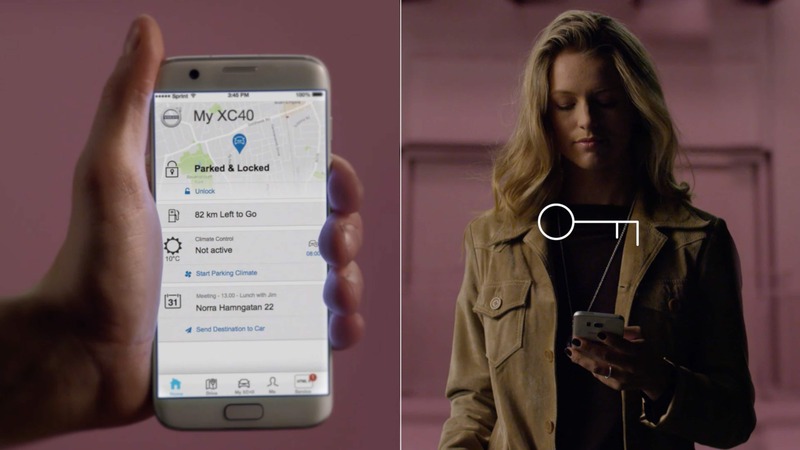 With the app, you are always connected to your car. Find where it’s parked, control cabin temperature, lock and unlock remotely and more. Should you be involved in an accident, a Volvo On Call operator automatically contacts you to arrange assistance. When you get into the car in the morning, it’s heated or cooled depending on ambient temperature and the navigation system knows where you’re going, thanks to Volvo On Call. Use the car locator map to find the street where you parked your car. See your fuel level and how far it will take you, when it’s time for service and what the temperature is where you parked. In-Car Delivery saves you time by using the connectivity of the XC40 to allow online shopping to be delivered to the trunk of your car while it’s parked. You don’t have to wait around for a parcel to arrive. Experience a unique feeling every time you enter the cabin. Craftsmanship and carefully selected materials create a unique feeling each time you enter the cabin. Natural light from the panoramic roof, a comfortable seat, clean air and ambient LED-lighting are just some of the features. The panoramic roof floods the whole interior with natural light and on a warm day you can open it up and enjoy the sun. Made from 100% recycled material, the textile interior mats of the XC40 combine modern style with sustainability. Good music makes all the difference. Every XC40 features Air Woofer Technology™ and for the ultimate experience, the Harman Kardon® Premium Sound delivers a beautifully balanced, powerful sound.
" With its mix of comfort and class, safety and style, the new XC40 excels in all the areas that are important to buyers. Amid a year of great new cars, it stands out as the most impressive by far." Different drivers need different Expressions. Which one will you choose? Explore the Volvo XC40 in glorious detail with our interactive 360° view. The T5 and D4 engines with AWD all-wheel drive are true high-performance units. Still, the fuel economy performs at an impressive 39.2 and 55.4 mpg respectively. Fit 479 litres to the top of the rear backrests. Even more impressively, the folding floor can be adapted to whatever you are carrying. 4.4 m long and 1.8 m wide, the XC40 is built for city life with a compact exterior. Thanks to smart design and a height of 1.6 meters, the interior is very spacious. Up to 13 speakers combined with new Air Woofer Technology™ brings you a perfect sound experience – all mounted to allow maximum cabin storage. You get the best out of the car. We take care of the rest. Share. Deliver. Connect. With a range of connected services the new XC40 is a mobile hub that makes life less complicated. We look at three ways that it can help you free up your time.